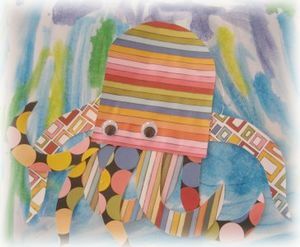 This free art project is a fun activity for preschoolers, especially if an adult can cut out the parts for the octopus before the project begins. Older children will be able to use the template pieces to trace around and cut out their own octopus pieces. We’ve created a printable octopus pattern, which should be saved to your computer, then enlarged to fit a normal page before printing. To do this, start with the Paint program, usually found under Accessories in your computer (or a similar graphics editor program), then open up the octopus pattern. Select Page Setup, and under the Scaling option, choose Fit to 1 by 1 page, or simply Fit to Page. That should enlarge the image to print out at the largest size possible to fit on a single sheet of paper or, even better, cardstock. Cut out the octopus pieces and trace around them on wallpaper, colored paper, or scrapbooking paper – one head and eight tentacles for each octopus. Alternatively, if you have a good eye for design, you can draw and cut out your own octopus pieces. First, wet the art paper with a damp towel to prepare it for the watercolors. We painted the ocean background with cool colors – blue, green and purple. We also sprinkled salt on the wet paint to give it a mottled texture. While the paint was drying, we began work on the octopus. You will need to glue eight tentacles to the bottom of the octopus head, working from the back. Now comes the fun part: turn over the octopus and find a good place to glue it to the watercolor sea. You might like to put the octopus right in the middle of the page, but it’s okay to have the tips of the tentacles going past the bottom of the page, if you like it that way. We did! Lastly, we added the googley eyes, because no octopus is complete without googley eyes. We placed them low on the head, just above the tentacles. We had so much fun making our paper octopus pictures. We hope you do too! Thanks to the girls (and mom) from Flipflop and Applesauce for showing us how to do this art project!